Bro, I agree, but you're not getting my point... the filter is actually just as or more important than the oil itself. Since our environment is dustier, it will clog up and become less efficient sooner than in places like the US, so it will restrict oil flow in a shorter time period. So we Pakistanis should ALWAYS change the filter with our oil, whether that's at 5,000km or sooner. Even if I were to run a 10,000km drain interval on my vehicle in Pakistan, I would still change the oil filter at 5,000km. I spoke to my Service Manager at Toyota Central and he said they'd be happy to use a different oil if I were to provide it. Just wondering if Indus Motors will try to say my warranty would be voided if I were to use a higher quality oil, just because it's not Toyota oil. 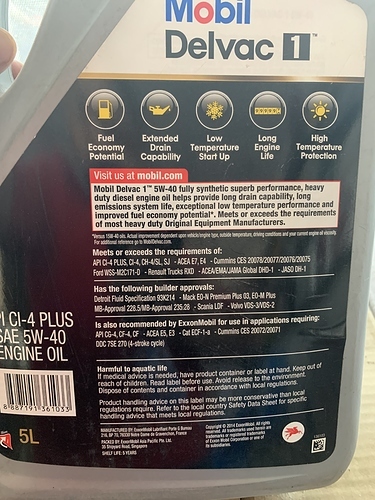 Planning on using Mobil 1 full synthetic or something similar with a CJ rating or better. Don't use 20w50 oil for new engine, 5w40 is the best upto 5000-8000km for our diesel fuel. Any particular brand or type of oil you recommend ? I agree that the oil poured by dealership is crap and it is more so you can visit them and pay more often. M using caltex mgx400 15w40 from caltex dealerships for my Revo 3.0 1kdftv, but for your new engine 2.8 it's best to use 5w40 or 10w40 fully synthetic. All I’ve found so far is Mobil 1 5w50 here in Karachi. Anyone know where to get 5w30 or 40? Please reccomend the best oils now that i would be able to get at toyota or reccomend the place i should get the oil islamabad. Thankyou to all of your insights all of you, this was very helpful. I’d be thankful if you guys also mention some other helpful tips like these. Where do I buy this from in Karachi? Not sure about Karachi. I have checked a couple of places in Islamabad and it was available here. 5L pack here was 9000 Rs. Having trouble syncing my iPhone contacts to the new Fortuner. It gets to 56% and then hangs indefinitely. I’ve tried unpairing and then re-pairing the phone, but it just stops at 56%. Anyone else experience this and resolve it? Happened to me once only. Tried it again and it was successful. Not sure why it hangs. Player is not that great though. Thanks Umer...I’ll try again tomorrow. Maybe it’ll sync by the time I reach my office 45 mins away. Where were you able to find Devlac 1 in Islamabad? It is available at Perl Lube. Next to BBQ tonight on GT road opposite DHA2. 20” wheels would require tires with shorter sidewalls, which will result in a harder ride and higher propensity to damage wheels. My suggestion is no.